The Dachau liberation reprisals were a series of incidents in which German prisoners of war were killed by American soldiers and concentration camp internees at the Dachau concentration camp on April 29, 1945, during World War II. It is unclear how many SS members were killed in the incident but most estimates place the number killed at around 3 or 4 dozen. In the days before the camp's liberation SS guards at the camp had murdered thousands of the camp's internees and sent tens of thousands more on death marches in which thousands were murdered by their guards. When Allied soldiers liberated the camp their reactions varied from being shocked, horrified, disturbed and angered by the masses of dead they found and the combativeness of some of the remaining German guards who initially fired on them and refused to surrender. Corpses of internees who were left by their Nazi guards to die in train at Dachau. Thousands of prisoners were murdered by the Nazis in the days before the camp's liberation. Just before the soldiers entered the complex, they found thirty-nine railway boxcars containing some two thousand skeletal corpses. Brain tissue was splattered on the ground from one victim found nearby with a crushed skull. The smell of decaying bodies and human excrement, and the sight of naked, emaciated bodies induced vomiting, crying, disbelief and rage in the advancing troops. Advancing soldiers from H Company, 22nd Regiment used a loudspeaker to call on the SS to surrender, "but they wouldn’t". The American troops were then fired on by machine gunners in a guard tower and a building. Upon moving deeper into the complex, and the prisoner area itself, more bodies were found. Some had been dead for hours and days before the camp's capture and lay where they had died. Soldiers reported seeing a row of cement structures that contained rooms full of hundreds of naked and barely clothed dead bodies piled floor to ceiling, a coal-fired crematorium and a gas chamber. "The stench of death was overpowering." According to Harold Marcuse, the camp commander SS-Hauptsturmführer Martin Weiss, together with the camp guards and the SS garrisons, had fled the camp before the arrival of U.S. troops. SS-Untersturmführer Heinrich Wicker (killed after the surrender) was left in charge and had roughly 560 personnel at his disposal; these came from conscripted inmates of the SS disciplinary prison inside the Dachau concentration camp and Hungarian Waffen-SS troops. 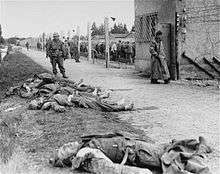 General Dwight D. Eisenhower issued a communiqué regarding the capture of Dachau concentration camp: "Our forces liberated and mopped up the infamous concentration camp at Dachau. Approximately 32,000 prisoners were liberated; 300 SS camp guards were quickly neutralized." The Dachau liberation reprisals were documented among others by US Army photographers Paul Averitt, George Gaberlavage, Sidney Rachlin and Ed Royce, Sr.
Lt. Col. Joseph Whitaker, the Seventh Army's Assistant Inspector General, was subsequently ordered to investigate after witnesses came forward testifying about the killings. He issued a report on 8 June 1945, called the "Investigation of Alleged Mistreatment of German Guards at Dachau" and also known as "the I.G. Report". In 1991, an archived copy was found in the National Archives in Washington, D.C. and was made public. After he had entered the camp Walsh, along with Lt. Jack Bushyhead, the executive officer of Company "I" organized the segregation of POWs into those who were members of the Wehrmacht and those who were in the SS. The SS were marched into a separate enclosure and were shot by members of "I" Company with several different types of weapons. The investigation resulted in the U.S. Military considering courts-martial against those involved, including the battalion commander Lt. Col. Felix Sparks, while Lt. Howard Buechner was cited in the report for dereliction of duty for not giving the wounded SS men in the coalyard medical aid. However, General George S. Patton, the recently appointed military governor of Bavaria, chose to dismiss the charges. Therefore, the witnesses to the killings were never cross-examined in court. Colonel Charles L. Decker, an acting deputy judge advocate, concluded in late 1945 that, while there had probably been a violation of international law, "in the light of the conditions which greeted the eyes of the first combat troops, it is not believed that justice or equity demand that the difficult and perhaps impossible task of fixing individual responsibility now be undertaken". ↑ The caption for the photograph in the U.S. National Archives reads, "SC208765, Soldiers of the 42nd Infantry Division, U.S. 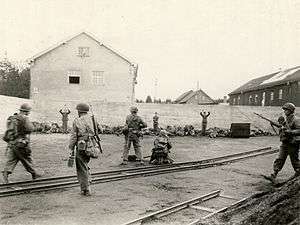 Seventh Army, order SS men to come forward when one of their number tried to escape from the Dachau, Germany, concentration camp after it was captured by U.S. forces. Men on the ground in background feign death by falling as the guards fired a volley at the fleeing SS men. (157th Regt. 4/29/45)." ↑ Corporal Robert W. Flora, H Company, 22d Regiment Dachau 29 April 1945: the Rainbow liberation memoirs. 1998. Texas Tech University Press. page 76. ↑ Sam Dunn (1998). Dachau 29 April 1945: the Rainbow liberation memoirs. Texas Tech University Press. p. 57. Retrieved July 1, 2011. ↑ Staff, quoting Abram Sachar on The Liberation of Dachau, Nizkor Project. ↑ Earl F. Ziemke, The U.S. Army in the occupation of Germany 1944–1946, Center of Military History, United States Army, Washington, D. C., 1990, Library of Congress Catalog Card Number 75-619027 Chapter XIV: Eclipse pp. 252,253. ↑ Perez, R.H. (2002). "DACHAU CONCENTRATION CAMP - LIBERATION". Retrieved 20 December 2013. 1 2 3 4 5 6 R.H. Perez (2002). "Dachau Concentration Camp Liberation (A Documentary)". Humanitas International. Retrieved January 14, 2011. ↑ Buechner, Howard (June 1986). Dachau: The Hour of the Avenger: An Eyewitness Account. Metairie, Thunderdbird Press, Inc. p. 97. ISBN 0-913159-04-2. ↑ Israel, David L. (September 30, 2005). The Day the Thunderbird Cried: Untold Stories of World War II. Emek Press. p. 176. ISBN 0-9770591-0-3. ↑ Corporal Robert W. Flora, H Company, 22d Regiment Dachau 29 April 1945: the Rainbow liberation memoirs. 1998. Texas Tech University Press. page 77. ↑ Rabbi Eli A. Bohnen, Chaplain Dachau 29 April 1945: the Rainbow liberation memoirs. 1998. Texas Tech University Press. page 159.